The topic of flasks doesn’t come up a lot here on Scotch Addict because every good scotch drinker knows that it’s best to enjoy your dram out of a whisky glass, not some flask. Sadly, it appears 1776.co is out of business. Their website is down. That said, from time to time, life calls for a flask. So when 1776.co emailed me to ask if I wanted to check out their flasks, I said yes. I did a little background research on the company. 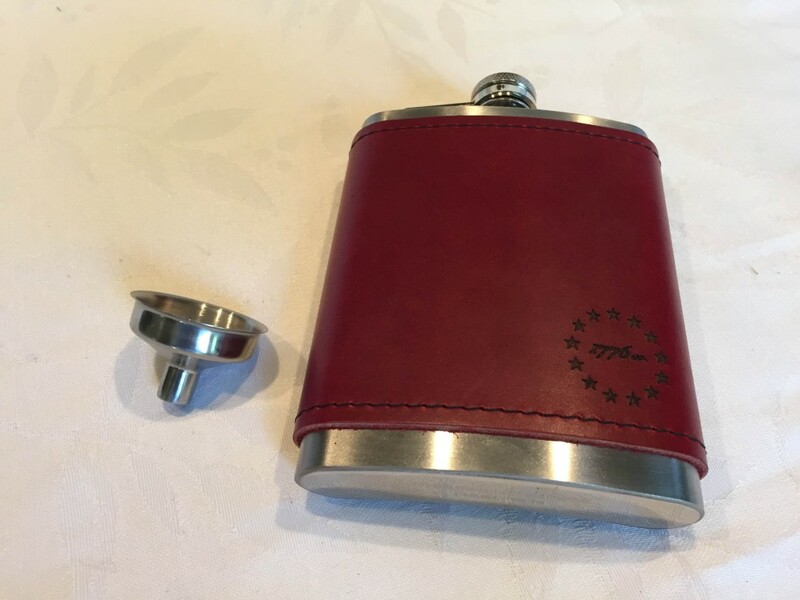 1776.co is a company based out of San Diego, California, and their flagship product is the leather flask in the photo above (that’s the actual flask they sent me, can you tell it’s not a pristine marketing photo? :)). They launched on Kickstarter in November of last year and raised nearly $25,000 to make a flask and a leather wrapped mason jar. One of the big points of pride for them is being made in the United States. They wanted to make sure that they celebrated America, celebrated craftsmanship, and it really shines through in their product. The flask is stainless steel, 8 oz., and mine is wrapped in this dark reddish leather sleeve (Revolution Red) that is as soft as one of my wife’s leather Coach purses. The leather is made by the Horween Leather Company, which is based out of Chicago and was founded in 1905. That’s amazing. Fun fact, they are the exclusive supplier of leather to both the NFL and the NBA! As I’ve said in the past, a flask has to check off all the boxes to deserve consideration and the 1776.co flask delivers. It’s stainless steel, solid construction, has an attached cap on a hinge so you can’t lose it, and the leather feels soft and luxurious. It’s not heavy and comes with a funnel. And as a nice bonus, fits perfectly in my back pocket. Bonus points for it being made entirely in the United States and with leather manufactured by a company founded in 1905! Want to get one? Sadly, it appears they are no longer in business. They’re $34 a piece (they feel like they cost way more honestly) and you can pick it up at 1776.co. 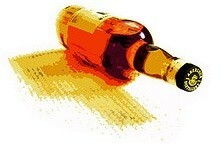 Remember to use the coupon code scotchaddict30 to get 30% off and personalized engraving is just an extra five bucks. Do you have one? Or thinking about getting one? I collect flask. I have flask from all the places I have traveled around the world. I have them with Embassy emblems on them; USMC flask, a couple of them, and some plain ones and some fancy one. Wow that sounds like a really fun collection! I have a couple of flasks. I only use them for short periods of time ie. a dinner or function where there will not be decent scotch available. One of the best features I’ve seen is a small window in the side so you can see how much is left or when you are filling it. I think mine came from Balvenie. I have mixed feelings about flasks…and for that matter, contoured pint whisk(e)y bottles. I own a flask and have used it, but there is always an element of embarrassment when I do…and I make jokes about using my flask…or considering using my flask. There is a connotation of sorts that people who use them can’t wait to get a snort from a legitimate glass and in an appropriate venue. We go to a lot of BYOB and I’m not much of a wine drinker, so I fine the flask and easy way of taking my scotch. Thanks for the article, thinking of buying one. Thanks for the great review, it’s missing a detail though. One thing I can’t get clear info on is where the metal flask is sourced or made? All of their details or videos on the website is about the leather crafting. Do you know where they source the metal flasks from? Ah! Good point, I’ll do some research (or ask) and update the review. Thanks db! Great review but the biggest beef I have with flasks is that I always seem to over fill mine which causes me to loose some of that precious liquid gold. To solve this, I have a second flask that I use more often as it has a glass front so I can see how much I have poured into it and my waste has decreased. Hmmmm that’s a good point, and 8 oz. really isn’t a lot so it’s easy to overfill! Looking for a specific cast lot of Scotch. Can’t find it in the Texas U.S. Nor in Edinburgh last summer. Silver label with seagulls flying across the label! Can you help me find this? K. Kyle, from the Highlands! Do I have to go to the distillery west of Scotland to get it????? I tried to cut & paste a picture of the label but it didn’t work on this site. I think you’ve hit on the important points: stainless (no risk of it rusting), an attached cap, the funnel is a nice touch (though any small funnel would do), and the biggie – Made in USA! I have an 8 ounce stainless flask, with (being a retired “Coastie”) a solid United States Coast Guard logo attached to the convex side, which lets it fit comfortably in my rear trouser pocket, or a jacket inside breast pocket. I rarely use it because most of the places I would love to take it don’t allow alcoholic beverages. I do occasionally bring it to friends’ houses if they’re having a party (and the beverage of choice is – ick – tequila) and I would like something savory to drink. Having the option to get a monogram or a logo put on it is another nice plus (like the horse head chess knight I have etched on my scotch decanter), but not a necessity… unless you have to check your flask at the door, in which case having your initials on it would be helpful just to make sure you’re getting yours back, and that it hasn’t accidentally gotten switched with another. I’m not sure about the “sight glass” part so you can see how much is in it while filling it (more important than emptying it because filling it can lead to an overflow); but that sight glass would be a weak point in the flask and if something bumped it the wrong way, the glass could either break or separate from the flask, and then you’d end up soaked in scotch. Filling it is easy if you train your ears, listening to the change in pitch of the “gurgling” as you pour the scotch in and it nears the top. (A slow pour gives the ear time to train itself.) And a quick slosh with the cap off and opening close to a trained ear will let you know how much is left before a refill is needed; the flask’s weight will also tell you that as it gets lighter as it empties. So those check boxes (minimum): stainless, attached cap, USA-made, 8-ounch capacity. Anything else (even a specialized funnel) is a nice plus, but the above four items are the necessity for a good flask.